Prince Albert Monceau hotel is ideally located in Paris : 10 minutes from the Champs Elysees and l'Arc de Triomphe, 10 minutes from Palais des congrès "Porte maillot", 10 minutes from Moulin Rouge and the Sacré-Coeur, 5 minutes from Parc Monceau. The hotel has recently been renovated, to add to the charm of the neighbourhood's numerous restaurants, bars, and the famous Lévis street market. The entire hotel is covered with free access to WIFI. Ideal for business men/women that have a laptop. ur rooms are fully equipped with satellite television, cable, hair dryer, telephone, safebox, smoke detectors, and wifi networks. Our rooms are all equipped with private bathrooms shower or bath. Bus 31 or 53 will drop you off at "POINT CARDINET". 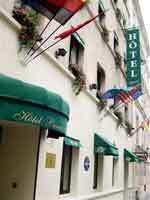 Our street and hotel are the right in front of the bank, Credit Lyonnais, from which you the be able to see our flags. Taxi : Ask the driver to drop you off à 9, rue Tarbé in the 17th district in front of the train stations "Cardinet". Metro : Malesherbes is our station, located on line 3. Once you've arrived at the station, take the exit with the esclator ans as you walk into the street, just keep going straight. The take the first right onto "Rue Cardinet". Walking in the same directions, as the circulation of the cars, you will then arrive (after 4 minutes) at the corner of our street with the bank Credit Lyonnais and our hotel is right in fron of it. By car : Take the "peripherique interieur" and exit at PORTE D'ASNIERE. Continue straight onto rue Tocqueville as on the map. Then take boulevard Perreire on your left and continue straight to the "Cardinet" intercetion. Our street is on the corner of the Credit Lyonnais bank.